Since its early years TGEU used different forms of quantitative and qualitative research to provide data for fact-based advocacy and to develop own research-based advocacy tools. Already in 2007, two years after its founding and in the very year of its official registration, TGEU conducted its first research. 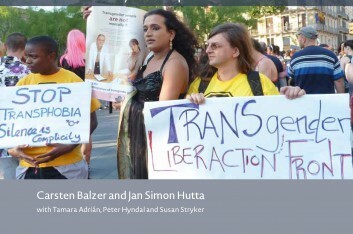 The results were published in 2008 in form of the first comparative report on the human rights situation of trans people in Europe: Transgender EuroStudy – Legal Survey and Focus on the Transgender Experience of Health Care. In 2009 TGEU started the Trans Murder Monitoring (TMM), a pioneering project in the collecting, monitoring, and analyzing of reports of murdered trans people worldwide. The TMM developed into the Transrespect versus Transphobia Worldwide (TvT) research project, which is TGEU’s longest running project to date. Its first research report Transrespect versus Transphobia Worldwide – A Comparative Review of the Human-Rights Situation of Gender-variant/Trans People published in 2012 is the most comprehensive research report on the human rights situation of trans and gender variant people. TvT also started a survey on “Trans and Gender Variant People’s Experiences with Transrespect and Transphobia”, which was conducted in the years 2012 to 2014 in form of peer research in India, the Philippines, Serbia, Thailand, Tonga, Turkey, and Venezuela. Since 2011 TGEU also publishes the TvT Legal and Social Mapping. The last update, the TvT Legal and Social Mapping 2014 covered the legal and social situation of trans and gender variant people in 116 countries across the globe. With the implementation of the ProTrans project in 2014 TGEU went one step further combining monitoring of transphobic incidents with victim support and advocacy, working with 5 partner organisations in Europe.